Born at Chichester, Sussex, England on 5 July 1861, son of the Rev. 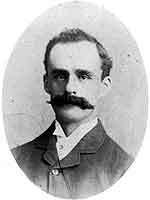 C. J. Bowen, he was educated at Molveenn and Victoria University, then studied law at Owens College in Manchester. In 1880 he emigrated to Canada and took up farming south of Morden, Manitoba. He later taught school before being called to the Manitoba Bar in 1898. He established a law practice at Morden. He served as a Bencher for the Law Society of Manitoba (1913-1923). On 19 September 1893, he married Gertrude Anna Buchanan, daughter of Irish immigrants Alex and Emma Buchanan. They had no children. He was a member of the Masons (Belmont Lodge No. 13), Odd Fellows, Canadian Order of Foresters, Knights of Pythias, and the Anglican Church. He died at Morden on 9 February 1923 and was buried in Hillside Cemetery. “A. W. Bowen, Morden, is suddenly called”, Manitoba Free Press, 10 February 1923, page 7. We thank Elizabeth Day for providing information used here.